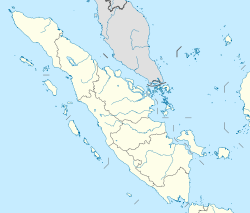 Sabang is a city consisting of a main island (Weh Island) and several smaller islands off the northern tip of Sumatra. The islands form a city within Aceh Special Region, Indonesia. The administrative centre is located on Weh Island, 17 km north of Banda Aceh. The city covers an area of 153.0 square kilometres and according to the 2010 census had a population of 30,653 people; the latest estimate (for January 2014) is 32,271. Sabang is also known as the northernmost and westernmost city of Indonesia. The Japanese occupied the island and installed numerous bunkers, fortifications and gun emplacements. Their remnants can still be seen, though most have been re-purposed or removed. On 6 May 1943, the Imperial Japanese Navy's submarine, the I-29, tasked with a Yanagi mission, landed the Indian leader and freedom fighter, Netaji Subhash Chandra Bose and his lieutenant, Abid Hasan at Sabang on Weh Island, instead of the Penang, to avoid detection by British spies. Sabang is served by the Maimun Saleh Airport. The airport is located southeast of the central city on Weh Island. The City hosted an international sail tourism event in September 2011. The sail race was participated in by around 50 ships with 15 crew members each. Besides sailing they visited interesting places packed in a 'tsunami' tourism, visit Gapang Beach and Iboih Beach with enchanting underwater scenery. Sail Sabang 2017 will held from Nov. 28 until Dec. 5 in Sabang. The event is the ninth installment of Sail Indonesia, an annual yacht rally that was first launched in 2009 on Bunaken Island, North Sulawesi. ^ Seta,William J. Atlas Lengkap Indonesia dan Dunia (untuk SD, SMP, SMU, dan Umum). Pustaka Widyatama. p. 7. ISBN 979-610-232-3. ^ RH, Priyambodo (28 May 2011). "Sabang to host sail tourism event in September". antaranews.com. Retrieved 13 December 2013. ^ "Sail Sabang 2017 aims to put Aceh on global tourism map". The Jakarta Post. Retrieved 22 November 2017. Wikivoyage has a travel guide for Sabang (Indonesia).